Surfers are a pretty avid bunch - meaning they tend to surf a lot. One of the interesting and challenging things about collecting information on surfers is that they are a relatively small group of ocean users (specially when compared to beach goers) but they represent a disportionately high level of overall coastal use - that is because they surf so frequently. The relatively small size of the group makes them easy to miss in random phone surveys etc., yet because they are so avid surfers represent an important group of users when measure a key indicator of coastal use, which is the number of visits to the coast. Our research on US surfers found an average avidity (surfs per year) of 108 surfs per year. A study on surfer health in Oregon found an average of 77 surfs per year. A large national survey from 2001 found an average of 22 surfs per year. That wide variation is likely due to comparing our targeted surveys vs. a broader national survey. Another reason whe avidity is important is because when estimating the economic values associated with surfing, the biggest multiplier is the annual number of visits. Avidity is typically calculated by multiplying the average number of visits per surfer by the total number of surfers who visit the study area. 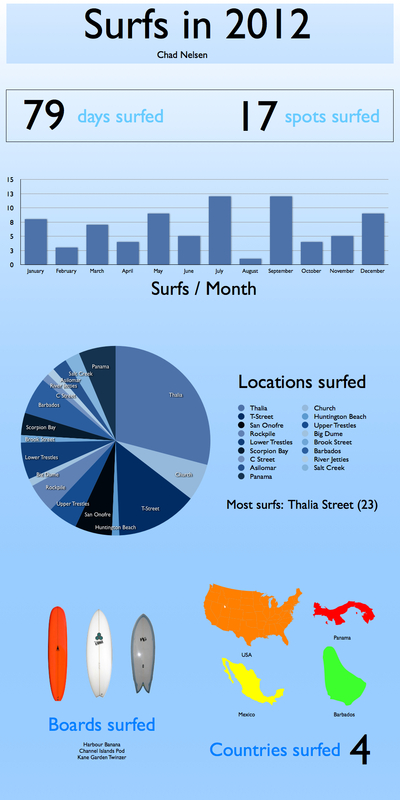 This brings my to the following infographic on my year of surfing. I know many surfers keep much more detailed information than is presented here. Please chime in regarding how you track your surfing. Even better, make an infographic like the one I did and I'll put together a catalogue of them to provide a more visual illustration of surfer behavior. Comment below or email me at here.